Guess what?! I didn’t cook or bake anything over the weekend! I guess I spoke too soon last Monday. I was feeling the pressure to make something since I said Monday posts would always be recipes and then I realized that was stupid. I bake or cook because I like to, not because I have to fulfill some requirement or expectation. Making a meal or a treat should be fun! Which is why I’m especially excited about this next dessert I’m about to tackle for the 4th. Yes, dear readers, I’ve decided not to let you down. Today’s Feast on This comes via theKitchn, a branch of Apartment Therapy. 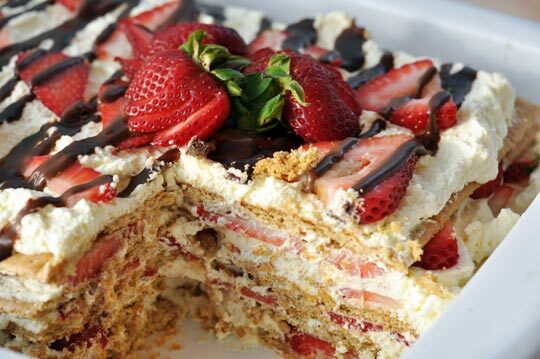 Enter: No-Bake Strawberry Icebox Cake. Tell me you wouldn’t want to eat this on a hot summer day with family and friends gathered under a small covered porch looking out to a well kept lawn containing camp chairs, a fire pit, and 2 lovely horses. Because that’s what I’m gonna be doing. 2 ounces dark chocolate, finely choppedTake out a few of the best-looking strawberries and set them aside for the garnish. Hull the remainder of the strawberries and slice each berry into thin slices. With a hand mixer or in the bowl of a stand mixer, whip 3 cups of cream until it just holds stiff peaks. Add the confectioners sugar, vanilla, and rosewater (if using) and whip to combine. Spread a small spoonful of whipped cream on the bottom of a 9×13 inch baking pan, or a similarly-sized platter. Lay down six graham crackers. 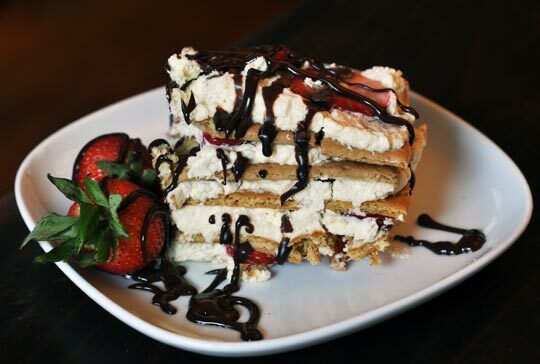 Lightly cover the top of the graham crackers with more whipped cream, and then a single layer of strawberries. Repeat three times, until you have four layers of graham crackers. Spread the last of the whipped cream over the top and swirl it lightly with a spoon. Add a few more strawberries. To make the ganache, heat the cream until bubbles form around the edges, then pour over the chopped chocolate. Let it stand for a few minutes, then whisk until the mixture is thick and glossy. Drizzle this over the layered dessert with a spoon, or transfer to a squeeze bottle and use that to drizzle. Refrigerate for at least four hours, or until the crackers have softened completely. Garnish with additional berries.